48 hours without adult supervision and I’m already joining a gang. Things tend to escalate quickly in Guanajuato. I meet some great people and also have the most hectic night of the chapter so far. 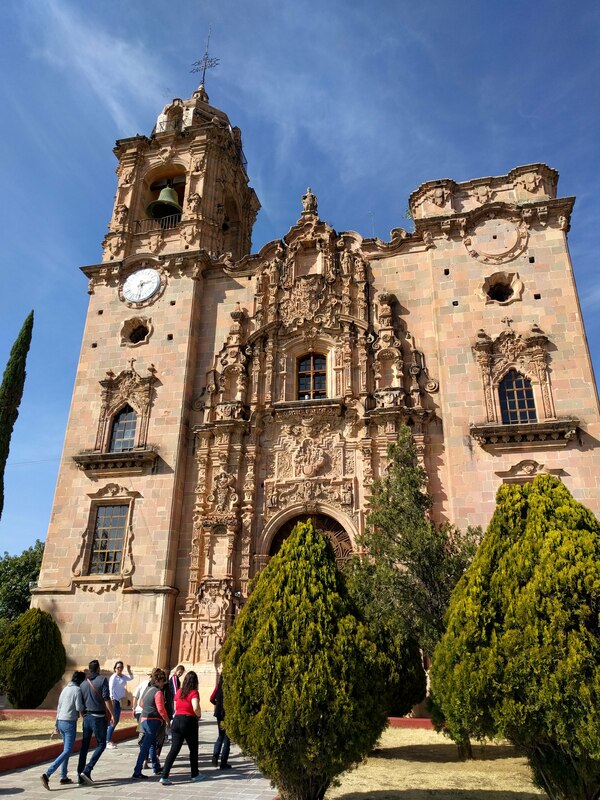 I departed San Luis Potosi and headed to my next stop, the city of Guanajuato (it is a state as well). It was not going to be a long ride, but it was one that I was really looking forward to. The final descent into Guanajuato is known to be an excellent riding road. Most of the way was fairly uneventful. I did find an abandoned church that was pretty neat. As Guanajuato approached, I could tell that the road was going to get exciting. The city is built down into a valley, requiring lots of zigging and zagging to get down to it. The path did not disappoint. 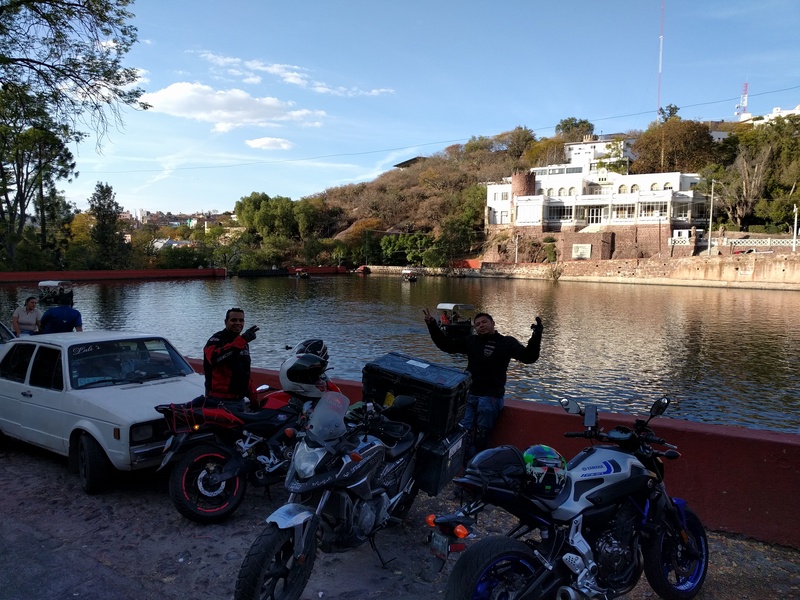 At a restaurant near to Guanajuato, I saw a few dozen motorcycles parked. It looked like some sort of rally was going on. Shortly after seeing this, I caught up to a group of three of them (perhaps a sign I was riding a little too fast). 🙂 The first one waved me by and I continued in their pack. They were good riders and seemed to know this stretch of road well. I enjoyed following them down into the city. Once we hit city traffic, they weaved on through and rode out of sight. I’m still a little uncomfortable riding between traffic like the locals do. At the first gas station in town, I saw my riding companions. For a moment I hesitated. But the brotherhood of riders certainly transcends any sort of language barrier, right? That was what I was hoping for at least. 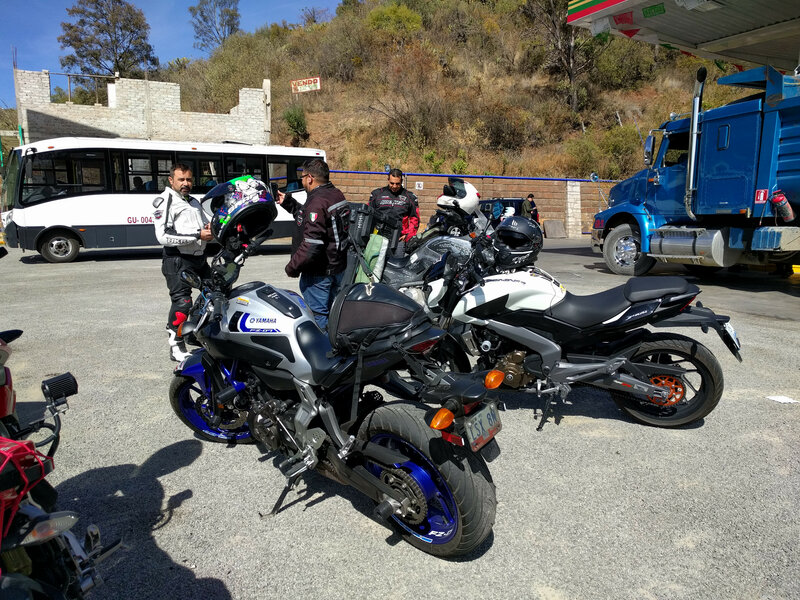 Thus begins the story of how I met Bajaj, Miguel and Edgar, my new moto-family. As soon as I pulled up, they seemed instantly interested in Annie. Bajaj spoke pretty good English, so we could fall back on him when my Spanish failed. Soon, unbeknownst to me, we were broadcasting live on facebook. You can hear Bajaj ask if Annie is an Africa Twin (Honda’s new, expensive, large displacement, adventure bike). 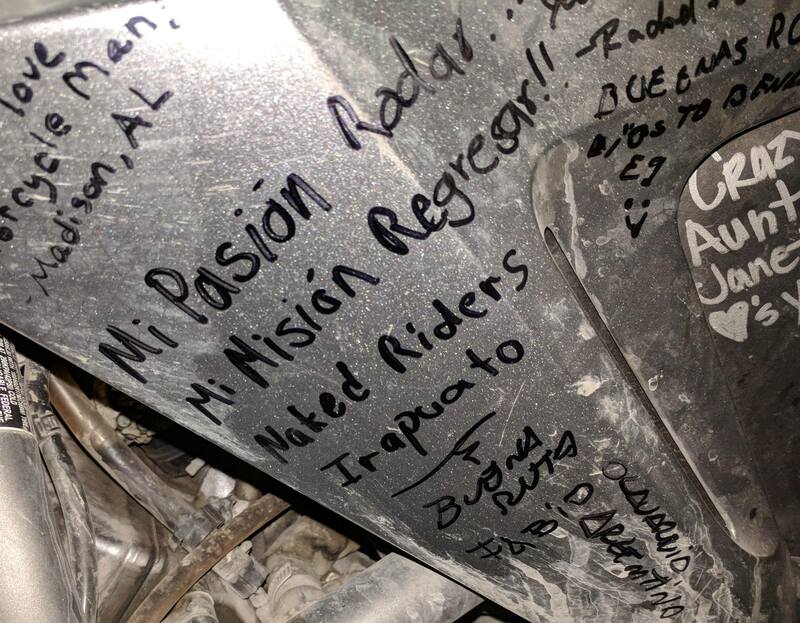 My Spanish is me explaining that I already have too many English signatures on the bike, so I need them to sign in Spanish. 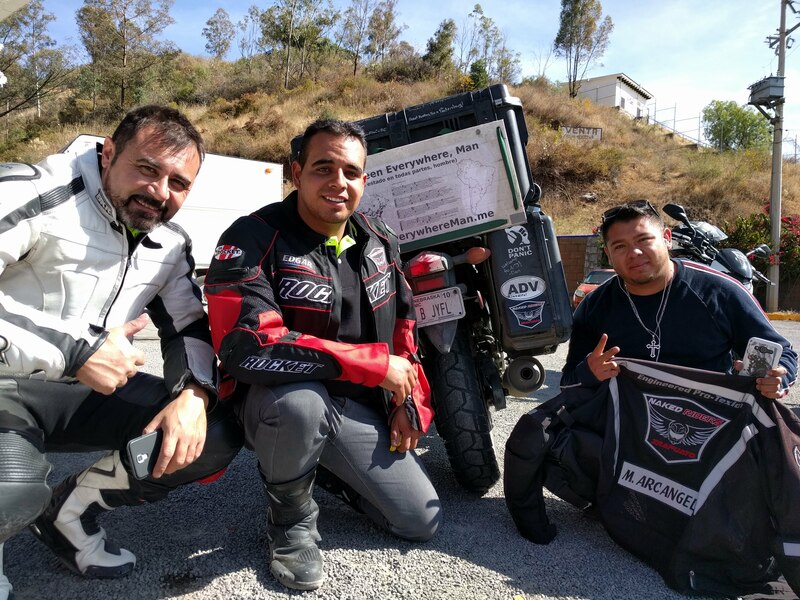 These three gentleman are part of the group Naked Riders Irapuato. If you are not a person familiar with motorcycle lingo, you may be thinking that they were wearing entirely too many clothes. 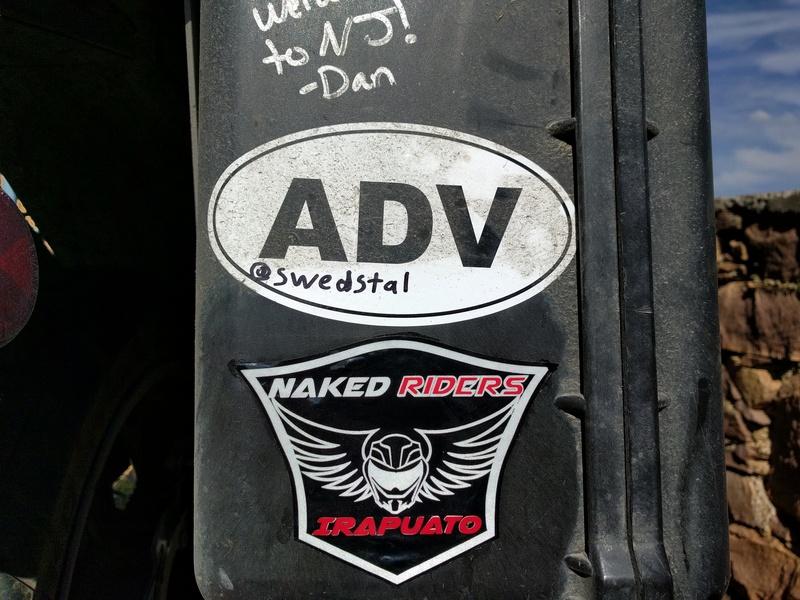 “Naked” actually refers to the style of bike that they ride. Generally, it is a no frills street bike. Everything you need in a motorcycle, nothing you don’t. It is the perfect bike for Mexico: Light, agile, affordable and fast enough. Irapuato is a city just up the road from Guanajuato. They were excited to sign Annie, writing some nice things. Miguel pulled one of their club patches from his pack and gave me a questioning glance. “Por favor!” I said excitedly. Miguel had to clean off a spot with a rag and then use super glue, but I think he got it attached well. 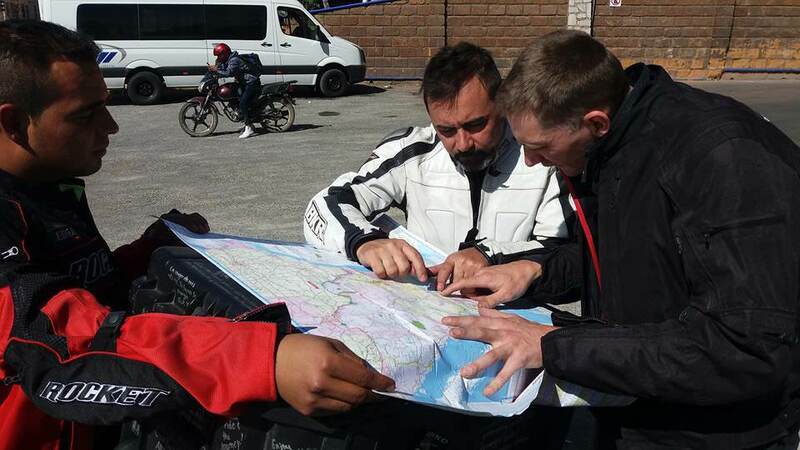 Bajaj is from Argentina, so we had a good time talking about my route and considering different options. I really love the above picture, because it perfectly sums up Edgar’s (on the left) personality. He is the kind of guy who holds a map when it is windy, waves you ahead of him on the road and always has snacks for the whole group in his pack. I don’t think he uttered a single word of English during our time together, but I feel like I know him well. 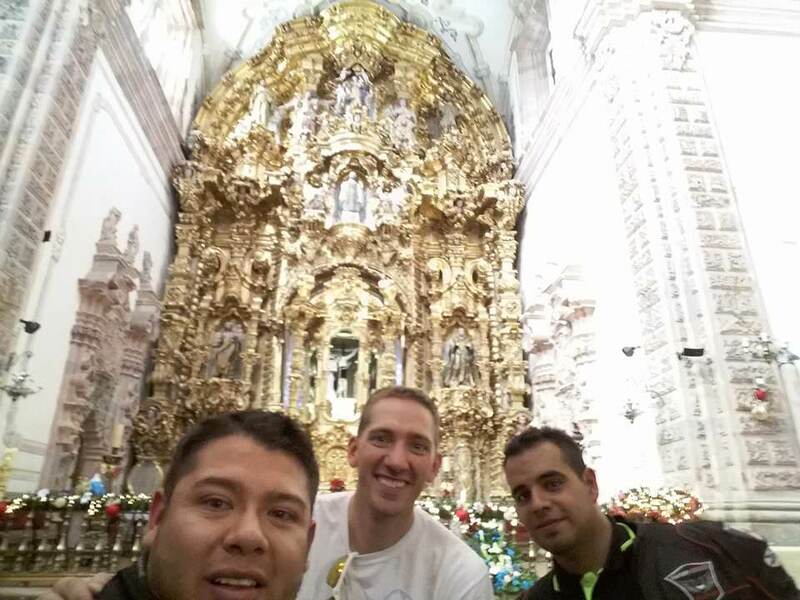 Bajaj had to take off, but the other two guys offered to take me on a tour of Guanajuato. How could I refuse! This would be the end of the English speaking portion of the day, meaning the rest of our time together would be both fun and educational. Guanajuato rose to prominence due to the abundant resources found in its mountains. Gold was already being mined here in the mid-1500s. In the 1700s it was the richest city in Mexico. This intersection of geography and resources is felt in the unique design of the city. Every street is winding and narrow, many are not wide enough for vehicles (….foreshadowing). 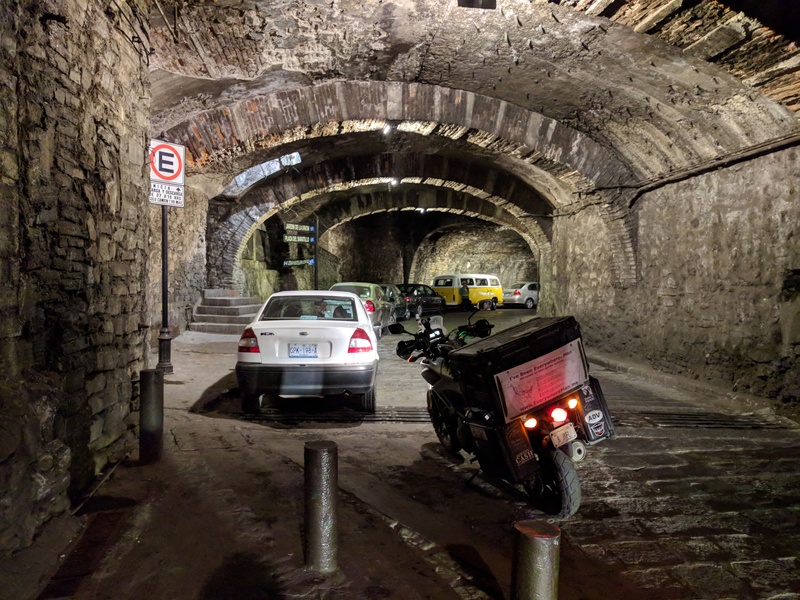 Additionally, many of the main traffic routes pass through tunnels underneath the city. I’ve never been anywhere quite like it. 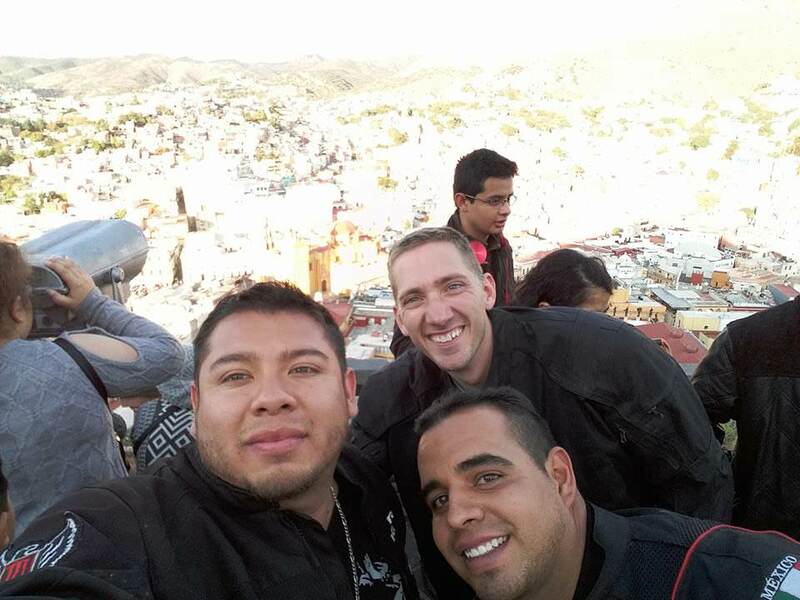 Edgar, Miguel and I stopped at a scenic overlook of the city from the north side. 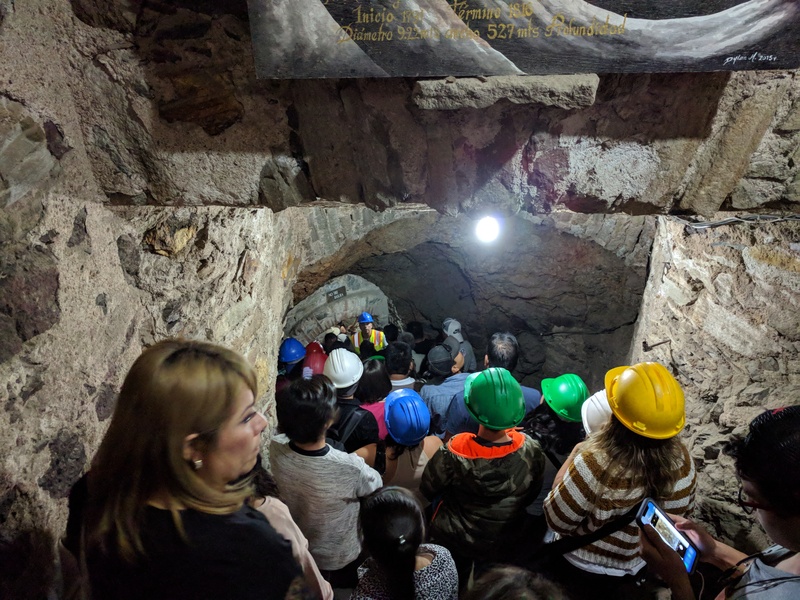 I mentioned what I had read about Guanajuato’s mining history and they asked me if I wanted to go down into one. Again, how could I pass that up! First we stopped at the La Valenciana church, which is right by the mine. 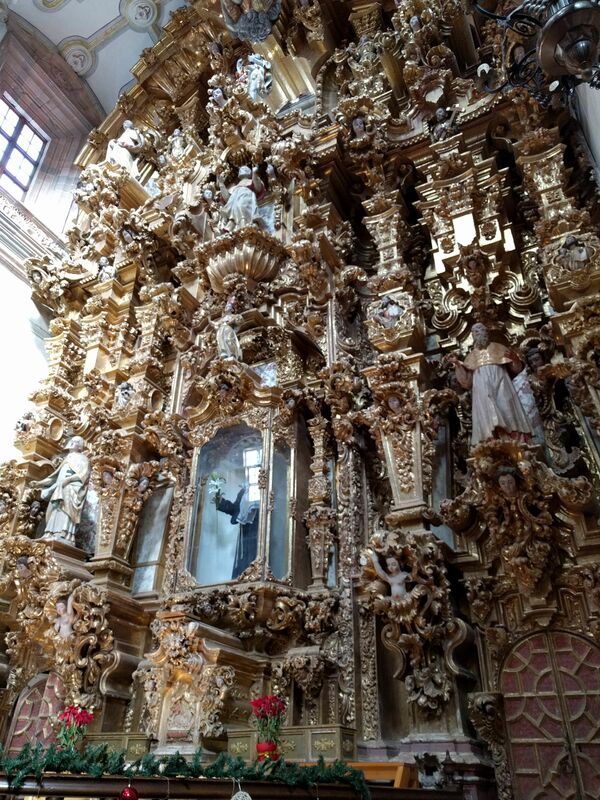 It’s not a huge church, but it is abundantly adorned with the riches found nearby. 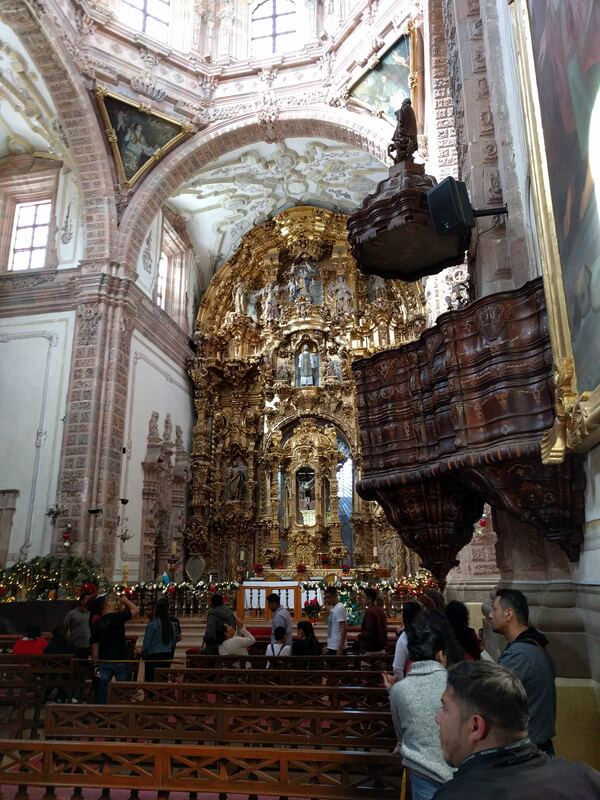 All three altars are covered in gold. If taking selfies in a church is a sin, hell is going to be a crowded place. Then it was down into the mine. The entry fee was only a few bucks, but Miguel insisted on paying for all of us. As we waited in line, we had some nice basic chats. 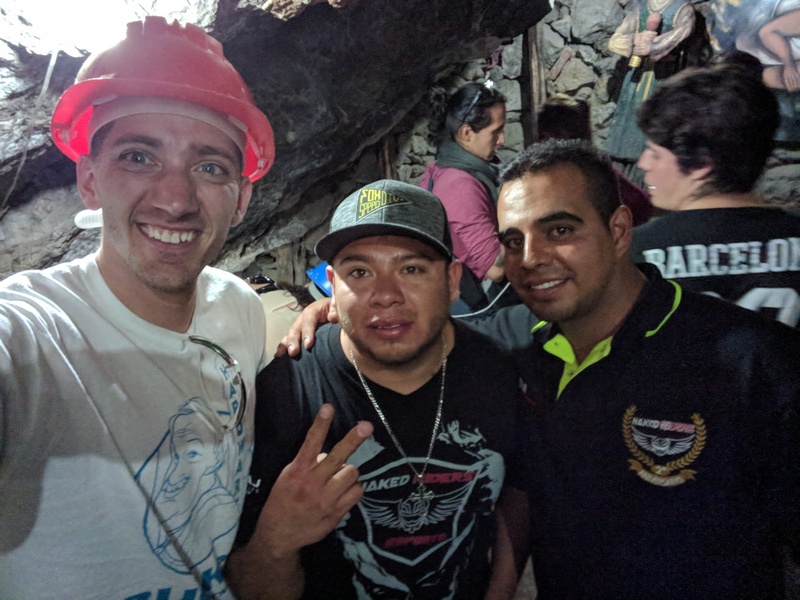 I felt like I was really struggling with my Spanish this day, so I did not get to know the guys as well as I would have liked. 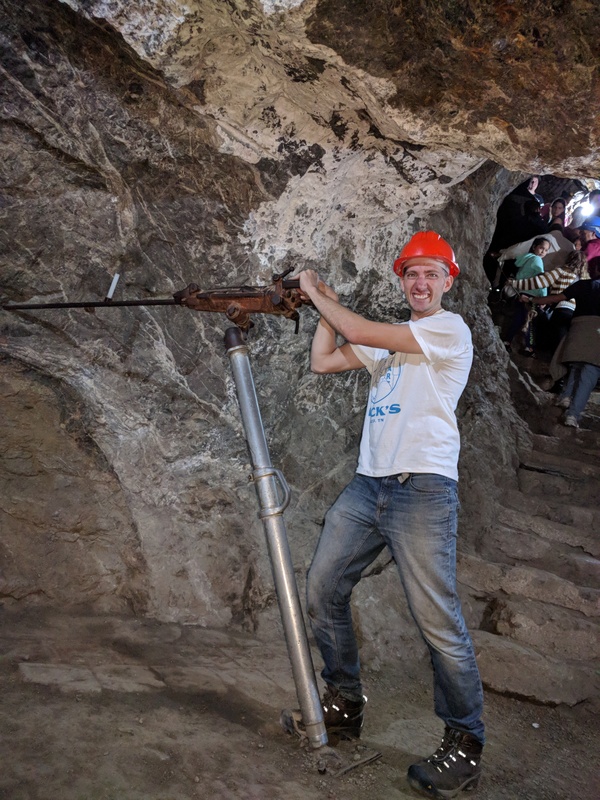 Our tour took us 70 meters below ground down steep, uneven stairs. Our tour guide was full of personality, but I must confess that I did not compute most of what he was saying. I’m pretty confident by now in finding a bathroom in Spanish. Understanding explanations of mining techniques? A little over my head still. But my tour was not over yet! We still had a couple of scenic spots at which to stop. It was finally time for my tour to end. All told, I think these guys spent about four hours with me. I don’t know if it was how they planned on spending their Saturday afternoon, but I hope they had at least half as much fun as I did. 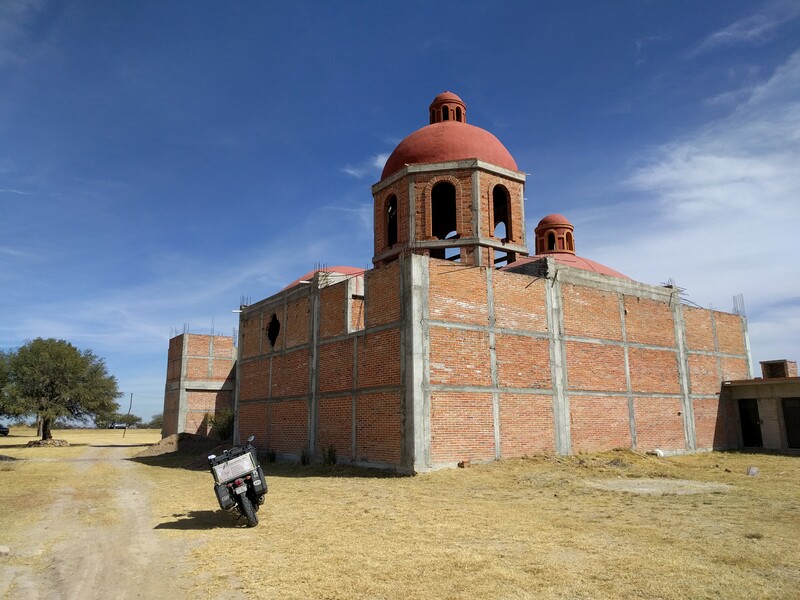 It is now a requirement that any trip I take through Mexico passes through Irapuato. Thank you Miguel and Edgar! As much fun as I had with the guys, I was starting to get a bit worried about time. As I’m still getting used to a foreign place, I like to have my lodging for the evening set up around 3 or 4pm. It was now 5:30pm. 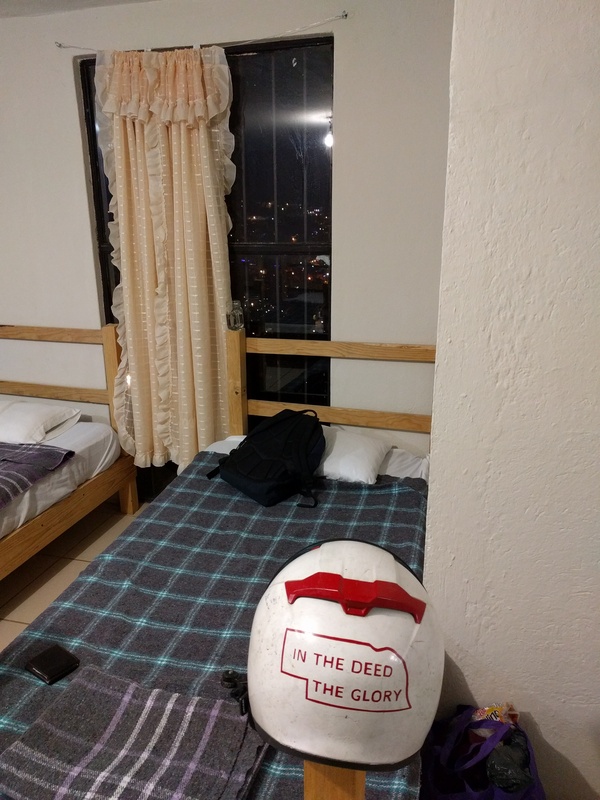 I had reserved a hostel in the center of the city the previous day, so I wasn’t too worried. Turns out….I maybe should have been. The first thing that threw me off was that my phone had stopped receiving a signal again. I was counting on it to navigate to the hostel. “No big deal,” I thought. I just found the address and plugged it into the offline navigation app on my other phone. 90 minutes later, I was still on the bike. Did I mention the road system here is a little crazy? Knowing I had such a short ride, I didn’t even mount my camera so this journey will only be documented with words. Traffic was thick, being that it was Saturday evening the night before New Year’s Eve. When I finally “arrived” at the destination of hostel, the GPS re-routed and took me on another long ride. I rode on some roads so steep that I needed to flex all the muscles in my arms and chest to keep from going over the bars. There were also some wicked topes. You may have noticed that when I use any Spanish word or phrase, I try to provide a translation. But as I learned in our previous episode, some words just don’t exist in English. “Tope” is one of those. Some might say that “speed bump” is a decent translation, but that would be akin to translating “bazooka” as “pocket knife.” They are in the same category, but are miles apart in intensity. Topes can sneak up on you in Mexico when you least expect it. Though the majority are marked with signs, the truly malicious ones attack when you least expect it. In the US, the punishment for speeding is a fine. In Mexico, the punishment for speeding is the destruction of your vehicle. When my GPS encouraged me to take the same long loop again, I decided to park Annie and continue on foot. Soon I realized my folly: The hostel was not on a vehicle road, it was on a pedestrian road. Perhaps this is still a sign of my Nebraskan bias (What do you mean I can’t drive there!? ), but it was a pretty big mistake. Even on foot a had a difficult time locating my lodging place, but I eventually tracked it down. The people there were really nice and showed me my place, both staff and other guests tried to direct me to a parking garage where I could leave Annie for the night. Not an ideal solution, but it looked like the best one at the moment. I returned to Annie, who had attracted the attention of a gentleman working in a law office near where she was parked. He actually has family in Saskatchewan and visits there often. He spoke great English and helped direct me to the nearest garage. More hills, more topes, more traffic congestion; but now it was completely dark too. I found an entrance at the top of the garage that was blocked off so I parked Annie again and jogged down four flights of stairs to the main, subterranean entrance. I explained my situation to the attendant (in shockingly proficient Spanish, I might add). He grimaced a bit and pointed to a sign that said motorcycles were not permitted in this garage. Ughhh….. They were not willing to make an exception, but at least tried to point me to the next garage. Jog back up four flights of stairs, more topes, more hills, more traffic congestion. I was taking some tunnels to the next garage so my GPS was even more unreliable. Mercifully, I finally found it. Unmercifully, it was the same story. No motorcycles allowed. The attendant there said he didn’t think any of the garages accepted them due to “security” risks. Miraculously, the data signal on my phone had returned. I began weighing my options, even perusing some satellite imagery to see about potential tent spots. I knew this was a bad idea. Any potentially flat space in this valley was already occupied. I did a quick search on the Booking.com app for cheap places with included parking. A hostel which I didn’t recall seeing before popped up. It was unclear whether or not they had a bed open, but I decided to navigate that way. On the way there, I realized that it was very close to the panorama that I had visited. I think I had driven right past the place about about three hours earlier. 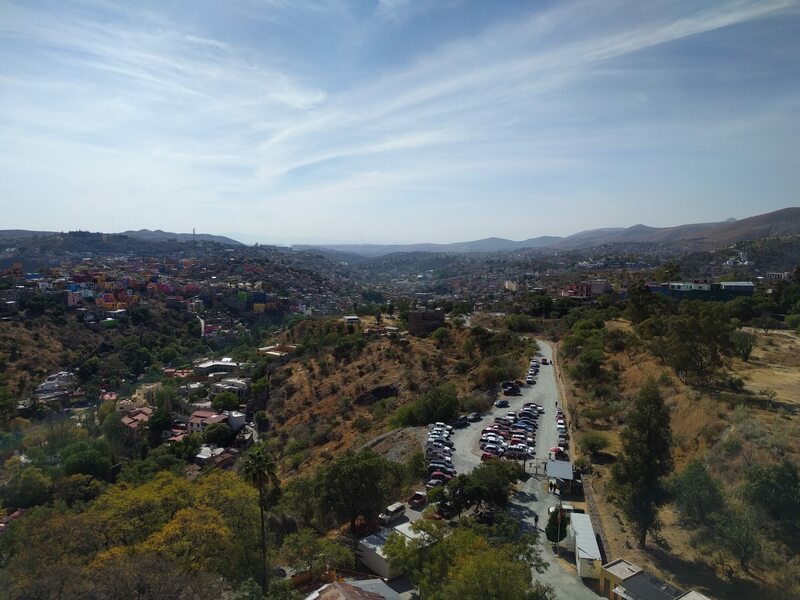 Like a shining city on hill, Annie and I rolled up to Hostal Casa Guanajuato. My host, Jerardo, was helping another group park their car in the gated driveway. It was kind of a game of Tetris, but finding a spot for Annie was not too difficult. Jerardo was really friendly, helpful and spoke perhaps the easiest to understand Spanish I had heard. Though when he said the price, I thought I mis-heard him: 150 pesos, about $7.50. Even though I was paying for two places this night, it was not going to break the bank. 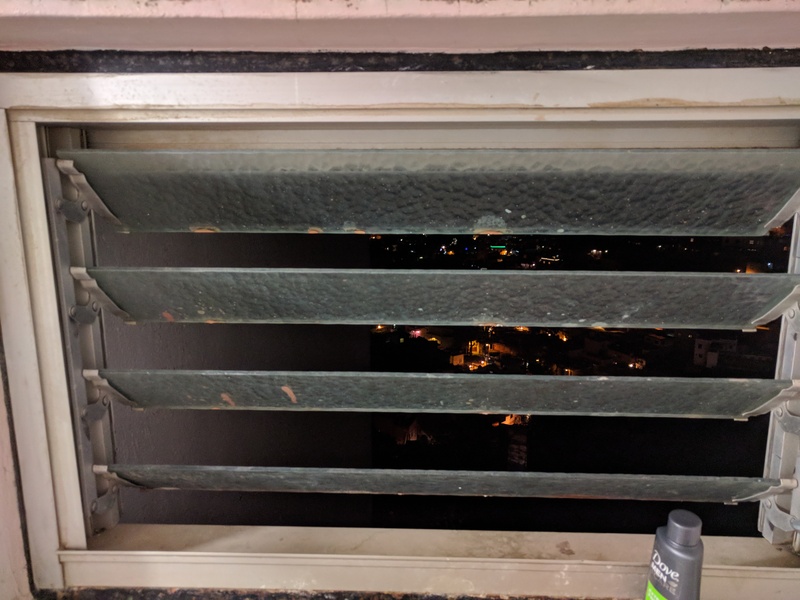 The place was simple, but I had a nice view of the city from my bed. 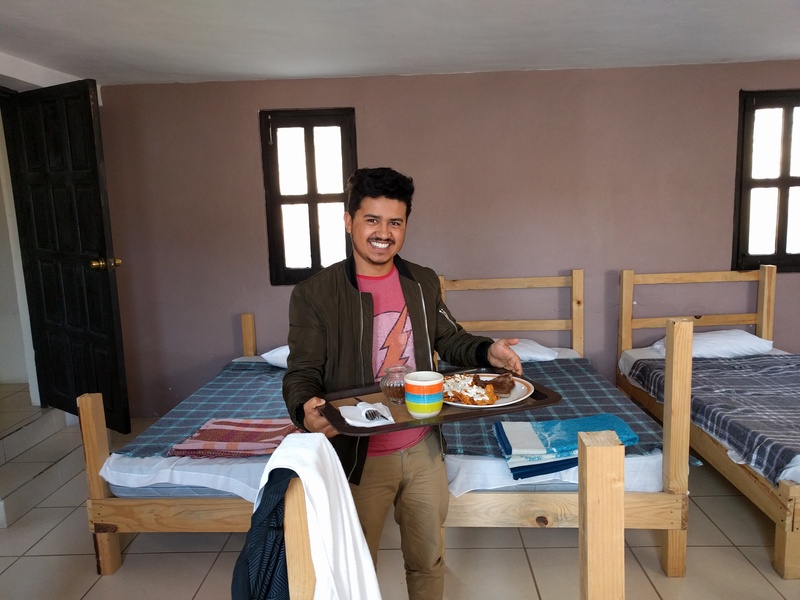 Breakfast was not included in the price, but for less than $3, Jerardo would cook you something and bring it to your bed. It was really nice. I lingered for quite a while since this hostel had incredible internet speed. (Upload everything!) 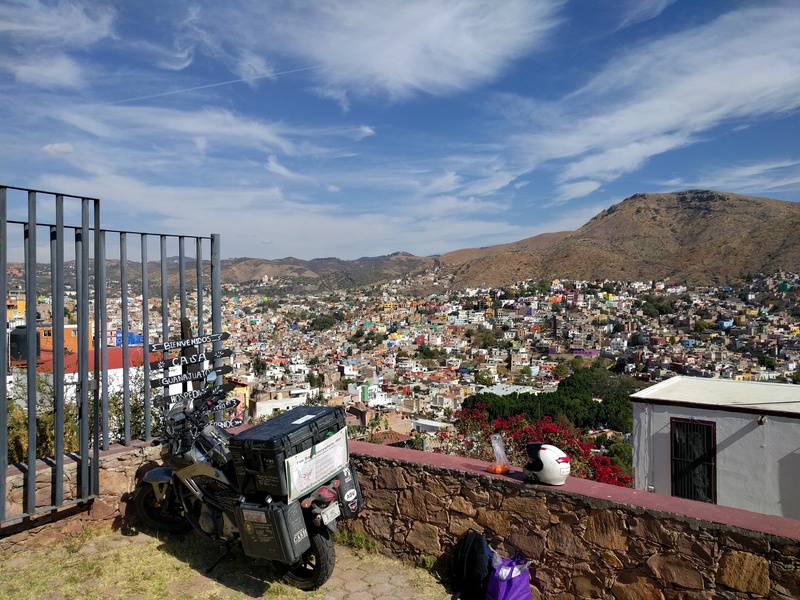 If you are wanting to see Guanajuato on a motorcycle, this is where you want to stay. Feeling like I had thoroughly experienced the city, I was ready to move on. However, I still wanted to capture a little media of the crazy road system. The traffic was much less intense than the previous evening. There’s no GPS signal in the tunnel, so I would just kind of guess which way to go until I was in open air again. Juat a place! Juat an experience! Juat a lot of words about Guanajuato! I’ll leave it there for this time. 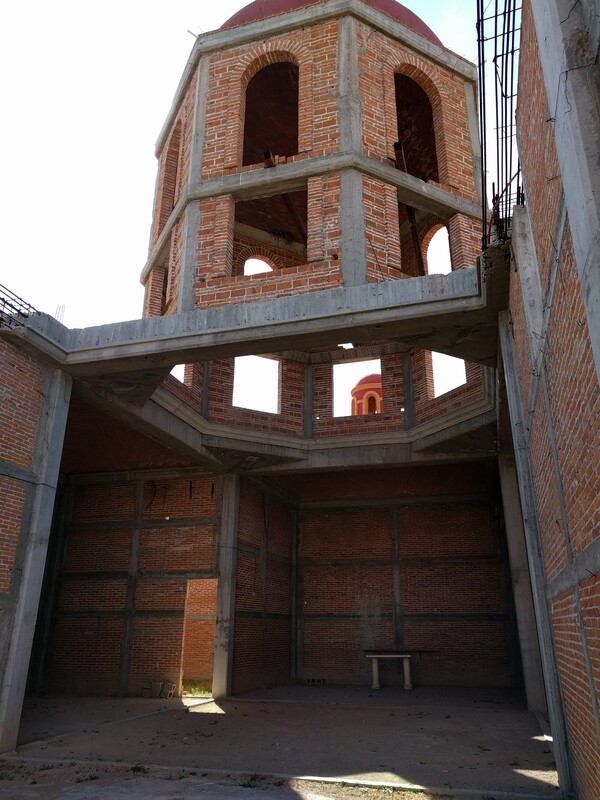 Realtime update: I’m staying at my first AirBnB in Puebla City. I’ll probably stay one more night here so I can cheer on the Chiefs tomorrow. I think my next stop will be Oaxaca, then on to Chiapas. Man!! I envy you!! Breet good trip my friend! Enjoy it!! I enjoyed reading so far!! Thank you! It’s been a wild ride so far. What an interesting city! Those tunnels are amazing. We just read more about it in the Mexico tour book we have. How blessed to have your “gang” show you around! Love you, Mom! The best of foreign travel. Searching (and not knowing). Finding. Then resting! Those tunnels are real AND metaphoric! Hah! 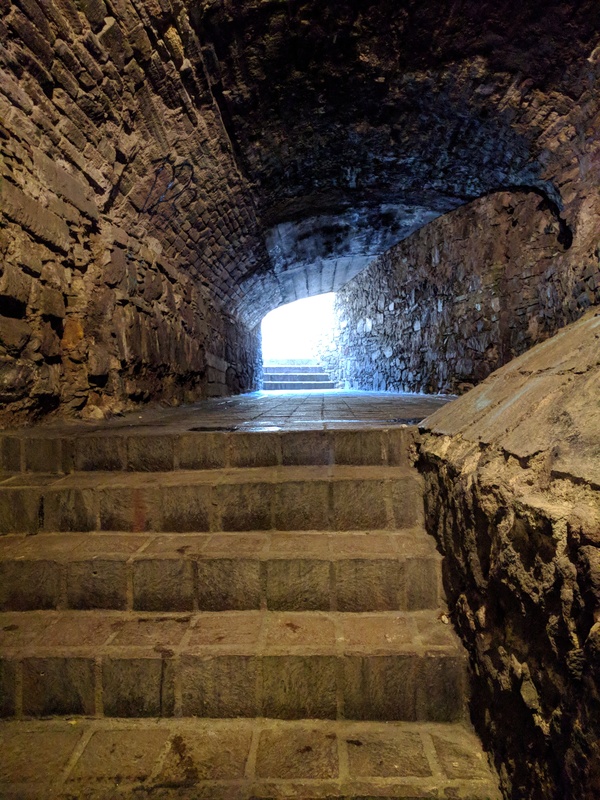 Yeah, “a light at the end of the tunnel” was somehow not a metaphor that I used in this post. What a missed opportunity! Sonic the Hedgehog gettin’ some love!